I attended Moorhead Public Schools throughout the entirety of my K-12 education. I graduated in 2006. Throughout my years of education, I had the opportunity and encouragement to get involved in a number of different activities, which is one reason I loved and still love this district. I was involved in athletics (including volleyball, basketball and track throughout junior high, but mainly soccer and dance in high school), as well as Key Club, Speech and music. Moorhead Schools gave me the opportunity to have a variety of experiences and interact with a variety of people. From activities to Advanced Placement (AP) classes, I was positively challenged by teachers and coaches, encouraged to learn and explore my own potential, and had the opportunity to meet other students from an array of backgrounds and interests. Because of this variety of experiences, Moorhead Schools helped me take away a more holistic worldview and prepared me for college and adulthood, both academically and personally. Why Do You Support the Legacy Foundation? I was fortunate to have a lot of great teachers, mentors, experiences and relationships during my time at Moorhead Public Schools that helped shape me and set me up for success after graduation. I support the Legacy Foundation because I want to help ensure other students get the chance to take advantage of the range of amazing opportunities the school district has to offer, and to help ensure basic needs are met so students feel ready to take on those opportunities. My mom graduated from Moorhead High School in 1951, I graduated in 1981, and my three sons have all graduated from Moorhead High. My mom was on the first girls basketball team in Moorhead. I was in football, wrestling, track and baseball during my time in the Moorhead Schools. My sons played football, basketball, and track & field. They also took advantage of other opportunities like Key Club, SADD, Math Masters and Advanced Placement curriculum. My children and I benefited from growing up in the community of Moorhead that supports education and students. The atmosphere in the schools in Moorhead was great for learning, making friends and participating in various activities. The dedicated teachers have expectations that the kids will learn, and they provide the tools needed to succeed in the classroom. The administration provides the framework and support to accomplish ambitious goals for our kids’ education. The community has embraced education and our kids by supporting recent referendums for the advancement of education in Moorhead. 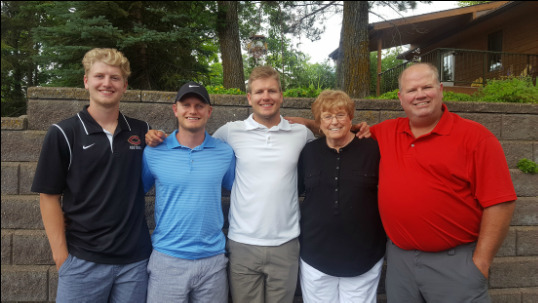 The Legacy Foundation is important because it will enhance opportunities for students in our schools and give alumni and members of the community an opportunity to partner with Moorhead Schools. I was a 1975 graduate of Moorhead High School. I came back and taught physical education and coached basketball and football for 27 years. My three children also graduated from Moorhead High. They played basketball like I did. They also played softball and volleyball. Moorhead High School was my life — education, profession and my passion — along with my family. It gave me a great place to be educated, a great place for my children to be educated, and a great place to work. I wanted to give back to a place that had a huge impact on me as a student, a coach, an educator and a parent. Both my children are students at the high school having attended Moorhead Area Public Schools since preschool. I am a teacher at Moorhead High School. I have a child who was in Spanish Immersion and one who is served by Learner Support Services. They were both in theater in elementary and middle school, one is a cross country and track runner, and both skied on the new Nordic ski team this year. I also started an Anime Club for kids who were looking for a place to belong but didn’t fit with other activities. The most critical thing a family with a child with a disability needs is the support of an excellent school. For some families, school can be a place of conflict. For our family, school has been a place of essential support. School is a place of "yes." My son has learned to share the message Moorhead Schools has taught him: people with disabilities are not helpless. They can do many, many things with the right help. Our daughter has had a very good experience in Moorhead Schools. But she would have been able to get that almost anywhere. Our son had an experience I believe he could only have had at Moorhead Area Public Schools. The teachers, paras, staff and administrators have helped us raise an incredible young man. Next year will be his senior year and the whole school should be proud of the young man we’ve raised together. As often as Moorhead Schools wants to be a place of "yes," too often our "no" is driven by funding. We have a supportive community that loves our schools. We needed a vehicle to channel the overwhelming support of our community into areas students need it most. I know our community. If we had a fund to ensure all kids got milk everyday, it would be full to the brim. If we had a way for people to leave a lasting impact on the school they love through financial gifts, we could do amazing things and fill our community members’ hearts too. The Legacy Foundation is the vehicle Moorhead has been waiting for. I support the foundation because of the potential to accomplish amazing things for our students.